How do I teach a person with ASD to be more independent? Teaching independence is a baby steps process that starts at an early age. When working with children with autism on any skill, you have to think it forward. How will this look and function at age 5, 10 or 18? Imagining where you want this person to be as an adult is a good motivator to teach independence skills. It gives a framework to set goals. There are small, gradual ways to build independence. One of the tools to help increase independence is visual supports. I have written about the effective use of visual supports in a past blog. Visual supports can be used to break down the steps of any task. When the steps are put on a strip, the person with autism now has those for a handy reference. I’ve used this idea for routines like getting dressed, toileting, hand washing and brushing teeth. There are some great ideas for breaking down routines on the Do2Learn website. Thinking this forward, these tasks strips could be used for doing laundry, dishes and other household chores. Visuals can also be used for scheduling. Schedules can be done for the day or within an activity. If a child feels anxious seeing the whole day’s plan, break it down into smaller sections like morning, afternoon and evening. When scheduling, think about teaching flexibility and how to cope with something unpredictable. Put the word “surprise” in one time block. Teaching flexibility and unpredictability are important life skills because we all know the day doesn’t always go as planned and things can change at a moment’s notice in the workplace. Build in a sense of choice at an early age. One of the first things that I see happen to people who are diagnosed with autism is their ability to choose for themselves or say no gets taken away. Making choices and refusing things is an important life skill. Start small with two choices on a board. “Would you like an apple or banana for snack?” You can also start with a non-preferred activity followed by the choice of a preferred one. For example, first we do math, then you can (let the child choose between 2 or 3 things they like to do). This teaches the child they can do something they don’t like and survive and delays gratification, all part of life. My children Marc and Julia are working on the concept of working to earn things they want through volunteering at a local Farmer’s Market. If Julia wants a Playmobil set which is more expensive than the DVD her brother wants, Julia knows she has to work 4 shifts to earn the Playmobil set while Marc only has to work a shift to get his first DVD. Both children understand this concept and realize you have to work more hours to get something that costs more – a valuable skill. Think about ways to build in independence when in the community. Both Marc and Julia practice checking out groceries at the self-serve checkout. Both can sign out their library items at self-serve check-out. I increase their job responsibility each week at the Farmer’s Market. For example, Marc had to work with the manager putting out the pylons for the market stalls. Sometimes he has to work with a different manager during different shifts who has a different. He has to learn how to follow directions from a different person, but using his visual supports can help the information to remain constant and predictable even when he is working with a different person. Julia has to bring the beverage orders to the vendors and take their money which helps her practice her memory and interpersonal skills. Teaching the concept of time fosters independence. Whether using a Time Timer, sand timer, of the traditional clock, letting children see there is a beginning, end and time limit for activities is a good way to teach patience and transitioning. Marc and Julia are now at a stage of independence where I can tell them we will leave a place at a certain time and they come and get me when it’s time to go. Marc has many activities built into times of the day such as meal times and snack times. Start small and build on success. If you want your child to be able to get a drink of water on his own, start with him giving you the symbol for drink. The next step is for him to get his own cup. The last step is for him to fill it from the tap or pitcher. The tap can be trickier because the temperature and flow of the water have to be adjusted, but those skills can be taught in steps as well. There will be little setbacks when teaching new skills, but independence is a step-by-step process. Build the foundation when the child is young and continue to build on those skills as they grow. My children are surprising me every week with new demonstrations of independence. Author: Bruce L. Baker, Ph.D., & Alan J. Brightman, Ph.D., with Jan B. Blacher, Ph.D., Louis J. Heifetz, Ph.D., Stephen R. Hinshaw, Ph.D., & Diane M. Murphy, R.N. 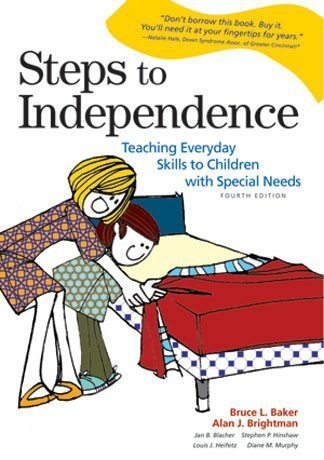 Tags: independence, Life Skills, special needs strategies. Parents are their children’s first and most influential teachers. That’s an important job and this popular, highly respected guidebook makes it much easier. 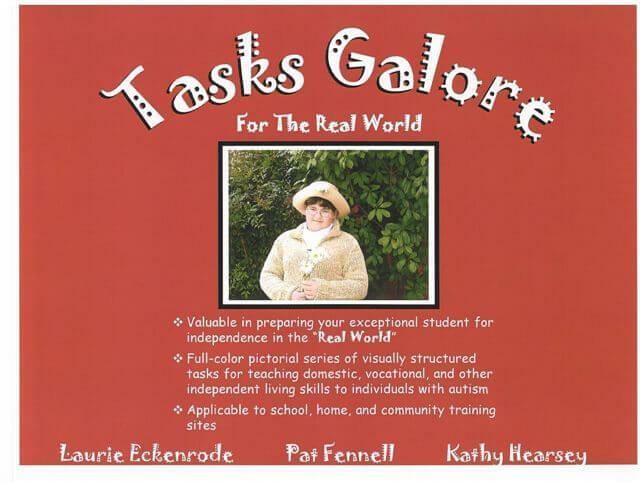 Tags: Life Skills, Employment, Tasks Galore, TEACCH, Vocational. This book is valuable for preparing your exceptional student for independence in the real world. Tags: employment and ASD, teaching independence, visual supports. 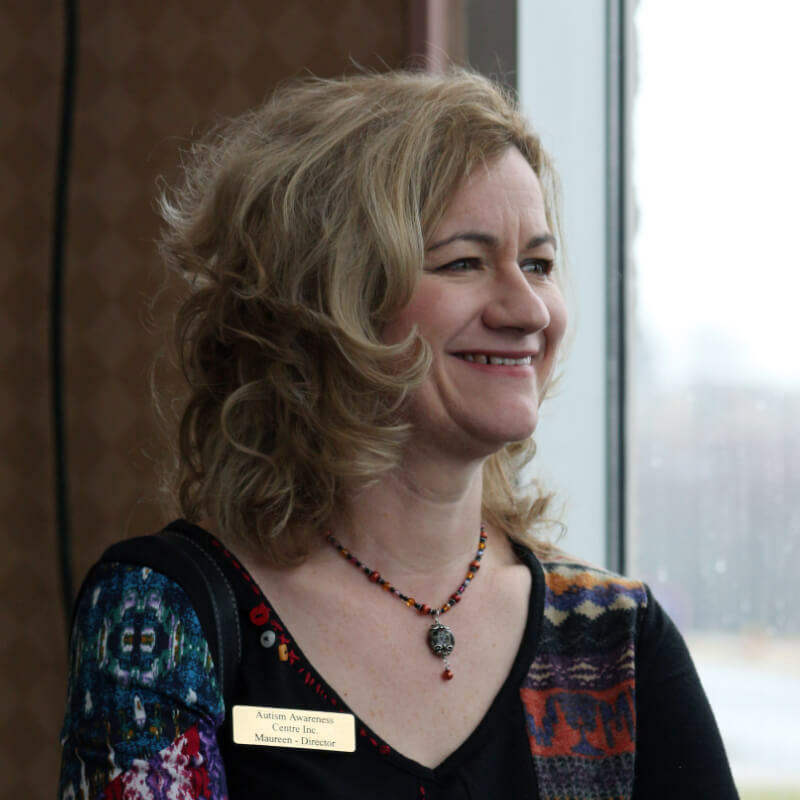 Hello Maureen, SOS 4 Kids has developed an online course called Home Alone Safety for Kids that may be a helpful learning platform for kids with autism. It’s a comprehensive safety program that equips youths with life skills to prevent dangerous situations and to create safer environments. SOS 4 Kids has recently partnered with Autism Ontario (Canada) and I thought that your readers might be interested in the program. Please check it out at http://www.safetycoursesforkids.com or contact me for further information.